Cute "rubber duckies"! These little guys are made of vinyl and have a hole in their beak to take in water; they squirt it out when their belly is squeezed! They do float but will tip over when they have water in their belly. 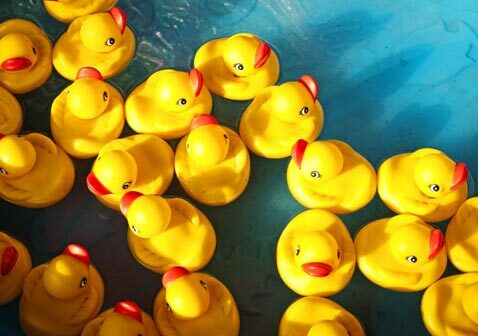 Most boys, girls and adults are never too old for a little ducky! Cute & squeezable duckies are 2". Cute and fun, these rubber ducky squirts have a tiny pinhole for the water to squirt out. So...it does take some time to fill the duck with water so it can act as a squirt! We still give it five stars as this is a Cute carnival prize.